Jews are a genetic goldmine. No one wants to resurrect the pre-genetic notion of race in which people were ranked by characteristics. But in order to offer invaluable insights into the origins of disease, scientists are committed to studying distinctive populations based on geography (Icelanders), cultures (gypsies), or religions (Amish). Since the founding of Ashkenazi Jewry until recent decades, despite being scattered to winds of the world, the rate of non-Jewish lineages that have slipped into the Jewish gene pool, per generation, is estimated at 0.5%. Disease genes spread throughout the Jewish world and have stayed there. In the late 1960s, when my aunt, grandmother, and mother died of breast or ovarian cancers, our family believed these were tragic coincidences. But when my sister discovered a lump in her breast five years ago and diagnosed with breast cancer, a genetic test discovered a variation of the BRCA2 gene, one of three forms of this cancer that target Jews almost exclusively. While the general female population faces a 10% possibility of developing breast or ovarian cancer, the lifetime risk with one of these mutations may rise to 80%. Most geneticists believe that these three mutations trace to Jews who lived 1,000 or more years ago when European Jewry numbered less than 25,000 people. As Ashkenazi Jews passed through a "population bottleneck" and their numbers began to explode, these genes spread quickly. They became, along with cultural signatures such as devotion to the Torah and Talmud, markers of being Jewish. I was tested and found out that I carry the BRCA2 mutation, and my nine-year-old daughter, the product of a mixed marriage, has a 50/50 chance of being a carrier. It's difficult to trace this wayward gene as my family tree disappears into the fog of the 19th century diaspora. The only thing scientists can say for certain is that, like some 40-odd other genetic disorders that are common among Jews, this cancer is a tragic symbol of our shared ancestry. While the first sketch of the human genome, unveiled in 2001, underscored that humans are more alike than different, the sequencing of the entire genome has ushered in a more precarious era. Geneticists are identifying chunks of DNA, known as haplotypes, and the results of their research stretches the limits of acceptable public discourse. HapMaps suggest that humanity is better understood as a collection of overlapping but identifiable populations that, remarkably, mirror traditional racial and ethnic groupings. Genetic blocks linked to human characteristics, including body type, behavior, skill sets, and brain architecture, vary among ancestral populations. Harmful mutated genes usually disappear because people who carry them die at earlier ages or have difficulty finding mates. Why haven't the deadliest genes passed out of the Jewish gene pool, eradicated by natural selection? Three scientists — Henry Harpending and Jason Hardy of the University of Utah and Gregory Cochran — have offered a fascinating and scientifically testable theory suggesting that Jews may be compensated by nature for suffering diseases because the genes that partly cause them are linked directly or indirectly to intelligence. These scientists, all Christians, were intrigued by the remarkable success of Jews — insert Jewish doctor or lawyer joke here — and their startlingly high scores on IQ tests, which almost all scientists believe are heavily influenced by genetics. Ashkenazi Jews average between 107 and 115, significantly higher than the world average of 100. Messrs. Harpending, Hardy, and Cochran identified 19 "Jewish diseases," including Tay Sachs, Gaucher, and breast cancer, that affect the enzyme pathways which influence neurological and brain development. They suggest that single variations of a disease gene may juice the brain while two may cause a crippling disease. And like a feedback loop, Jewish nurture may have reinforced Jewish nature. For hundreds of years, the smartest, most literate male Jews — the rabbis and moneylenders — mated with the wealthiest and wisest daughters, ensuring the spread of "smart genes," due to arranged marriages. Parsing the Talmud paid off. In other words, the scientists suggest, potentially harmful mutations may persist in the Jewish gene pool because their possibility of causing cancer is trumped by their greater likelihood of promoting high intelligence. I discussed this thesis with dozens of geneticists. Not one dismissed it outright, but only a handful would go on the record. Suggesting that behavioral characteristics are genetic and distributed unevenly across populations can put careers in jeopardy. 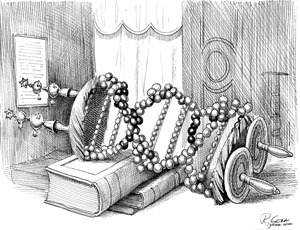 Finding links between Judaism and DNA, even flattering hints of genetically-shaped high IQ, is particularly unnerving considering the lessons of Jewish history. Yet we can't escape the fact that Judaism is different from Christianity or Islam. It's not purely faith-based. It originated as a tribal religion, tied to nationhood. It remains a rich tapestry with threads of faith, land, and blood ancestry — a genetic as well as a cultural inheritance. We don't fully understand how differences in disease proclivities, behaviors, and the brain have evolved. The great paradox of biodiversity research is that the only way to understand how similar humans are is to learn how we differ. Mr. Entine, an adjunct fellow at the American Enterprise Institute, is the author of "Abraham's Children: Race, Identity and the DNA of the Chosen People."